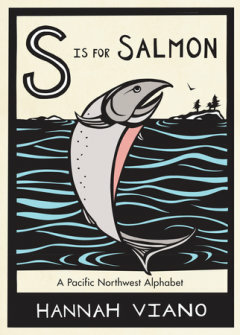 Hannah Viano, S is for Salmon: A Pacific Northwest Alphabet (Seattle, WA: Little Bigfoot/Sasquatch Books, 2014), 32 pp. The flora, fauna, and essence of the Pacific Northwest is beautifully captured in this artistic alphabet book by papercut artist Hannah Viano. A is for anemone; D is for Douglas fir; O is for octopus. Based on Pacific Northwest artist Hannah Viano’s regionally themed alphabet papercut art, this lovely children’s book sheds a new light on the ABCs that will appeal to young and old alike. Fans of Nikki McClure and Kate Endle will appreciate the beautiful handmade appeal of this book. Here are a few of the images from the book – absolutely beautiful! This entry was posted in books, nature art. Bookmark the permalink.